This sleek style moderne building was one of the most famous and popular shops in St. Petersburg (and Leningrad) throughout the 20th century. It was also the first true department store in the city, and a consistent source of scarce goods during Soviet deficits, albeit at times only for gold. The store began life as the Trade House of the Guards Economic Society. This co-operative organization was established at the end of the 19th century to help guards officers of the St. Petersburg garrison make ends meet on their modest salaries. Helped by generous contributions from the Tsar and his family, who traditionally served in guards regiments, the Society sold uniforms and equipment, but also food and household products, available at cost to its members and at fixed prices to members of the public. Quality was high, and these fixed prices were often lower than the average in other city stores. The system proved so successful that the Society's large premises in the Officers' Club on Liteyny Prospekt, opened in 1898, quickly proved inadequate to its needs. 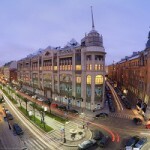 The land plot on Bolshaya Konushennaya Ulitsa, then the site of a cheap hotel, was purchased for the society and an international competition was held to choose the design of the new store. Ernest Virrikh, architect of the impressive campus of the Polytechnical Institute (1902) was the winner. His design, a smooth blend of art nouveau and industrial neoclassicism, was the first large construction project in Russia to use reinforced concrete. The corner tower was crowned with a tall, slender spire, echoing a peculiarly local architectural tradition. 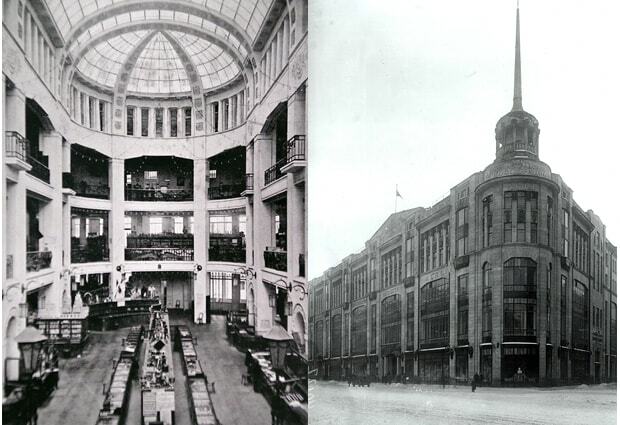 The state-of-the-art new store was popular with all levels of Petersburg society, and by 1911 the Guards Economic Society had the largest turnover of any trade company in Russia. The store was looted during the October Revolution and nationalized in 1918. The Bolshevik government would soon regret their decision to abolish the co-operative, and tried unsuccessfully to recreate the thriving business in the 1920s. In the early 1930s, the building was the central Leningrad store of Torgsin - the "trade syndicate" - a network of outlets, ostensibly for foreign visitors, that exchanged scarce goods and luxuries for hard currency, gold, silver, jewelry and antiques. As the system wound down in 1935, the store was renamed Dom Leningradskoy Torgovli - the "House of Leningrad Trade". The name sounds strange in Russian, and it is suggested that the more usual Leningrad Trade House - "Leningradskiy Dom Torgovli" - was rejected for the fear its abbreviation could cause unwelcome associations with enemy of the people no. 1, Lev Davidovich Trotsky. The building was severely damaged by shelling during the Siege of Leningrad, but restored 1944-1947, and continued to trade, selling goods freely but at inflated prices during times of rationing, and specializing from the 1970s in goods for children. 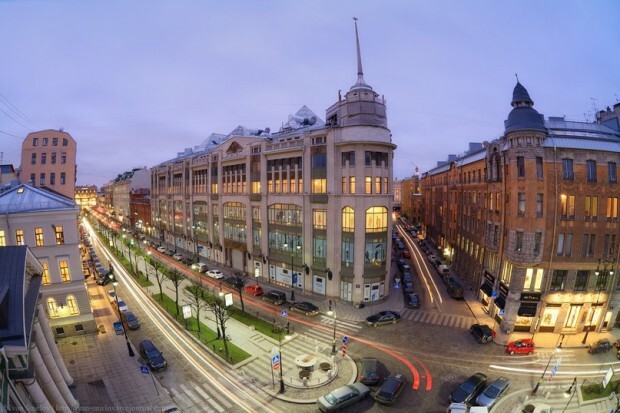 In 2006, the store was closed for renovation and reopened in 2012 as the St. Petersburg branch of Moscow's TsUM (Central Department Store), a modern department store selling premium designer goods.